In a move that could jeopardize the integrity of any future "HQ3" contest, Amazon is threatening to take its jobs and go home. According to a report in the Washington Post, which is owned by billionaire Amazon founder Jeff Bezos, unnamed sources in the company say it may not be "worth it" to take up to $3 billion in grants and tax incentives from New York City and State to create 25,000 to 40,000 jobs in Long Island City, Queens. In the past two weeks, the state Senate nominated an outspoken Amazon critic to a board where he could potentially veto the deal. 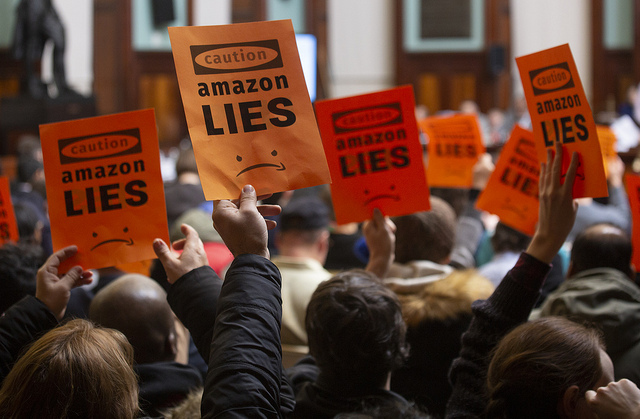 City Council members for the second time aggressively challenged company executives at a hearing where activists booed and unfurled anti-Amazon banners. That State Senator, Michael Gianaris, still has to have his appointment to the Public Authorities Control Board approved by Governor Andrew Cuomo, Amazon's biggest and most powerful supporter. And as noisy as those City Council hearings were, the council has no actual authority over the plan. If the story was meant to scare opponents of the deal and their colleagues in the State Senate to fall in line, Governor Cuomo was happy to deliver the message during a speech on Long Island Friday afternoon. "It is a very small nucleus, and it is a very small group of politicians who are pandering to the local politics. The State Senate has adopted that position, and that's what could stop Amazon," Cuomo said. "And if they do, I would not want to be a Democratic Senator, coming back to my district to explain why Amazon left because I pandered to their politics. It would be a tremendous loss," Cuomo continued. "It is the largest economic development transaction in the history of the state of New York. And I understand politics very well, but I've never seen a more absurd situation where political pandering and obvious pandering so defeats a bonafide economic development project." The Wall Street Journal's Jimmy Vielkind got Gianaris's response: "Very curious he had a slide ready to be presented 10 minutes after the news broke that Amazon was reconsidering. A cynic might believe this is all orchestrated. "The governor's always about pointing fingers at anyone but himself," he added. "He made a secret deal with Amazon. He made a bad deal with Amazon. He has to live with the consequences of that." In a statement, Eric Phillips, a spokesperson for Mayor Bill de Blasio, said, "The Mayor fully expects Amazon to deliver on its promise to New Yorkers." The Memorandum of Understanding between Amazon, the state, and the city says that the parties have until March 11th to conduct due diligence, and that the Empire State Development Corporation, the state agency shepherding the project through, would approve it in November. The Washington Post story said that Amazon has not yet signed any leases in Long Island City. Asked to comment on the Washington Post story, Amazon said the company is "focused on engaging with our new neighbors—small business owners, educators, and community leaders." On Saturday, ten community organizations opposed to the Amazon deal will hold a "coordinated day of outreach" along Roosevelt Avenue in Queens, featuring "interactive family-friendly activities, small business outreach, flyering, performances, canvassing, and more," according to a press release. The events will begin at Flushing Main Street at 9:30 a.m., move to Queensbridge Park at 10 a.m., Diversity Plaza at 12 p.m., and wind up at Corona Plaza at 2 p.m. Participating organizations include Queens Neighborhoods United, Desis Rising Up & Moving, and the New York City Democratic Socialists.